This template is designed to be a practical model you can quickly apply to your business or your clients' business. It will help you make the best use of social networks with the limited resources you have available. How will this example social media template help me and my business? Most businesses today have a presence on the main social networks. But having a profile on Facebook, Twitter, LinkedIn, Google+ or Pinterest is just the start of a managed approach to social media marketing. Often we see that social media updates are neglected or there are the wrong type to grow a business using social media. In short there isn’t a social media strategy and a plan for day-to-day operational management of social media. Creating a social media marketing plan will help you make the best use of social networks with the limited resources you have available. 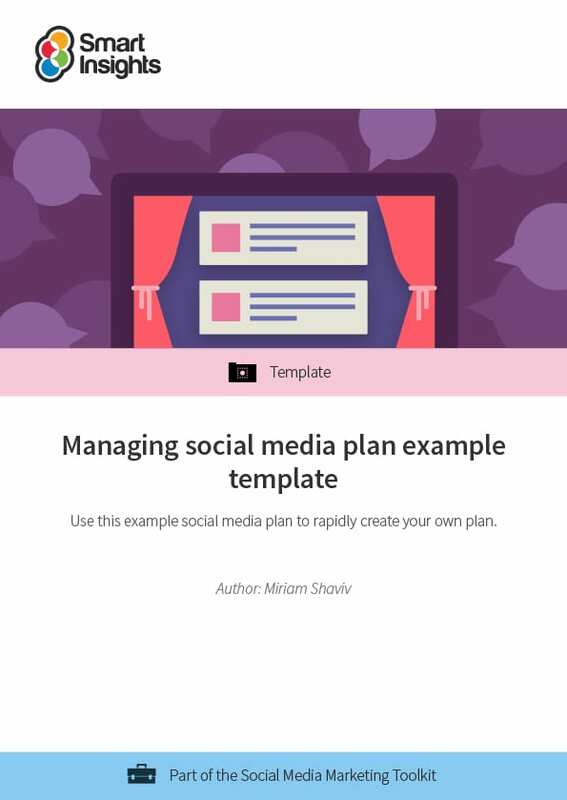 Our example social media plan is a Microsoft Word download so you can quickly edit it to form your own plan. Miriam Shaviv is Director of content at Brainstorm Digital who is active in creating and managing social media strategies for B2B and B2C clients. Connect to her LinkedIn here. How is the example plan structured? 1. Social media marketing strategy outline. This includes examples of the company vision and goals for social media, measurement, target audience, short and long-term strategies, resources needed and specific details on how to use each of the social networks. 2. A one-page social media plan summary. A simple, one-page social media plan example which small business owners or senior managers can use to brainstorm alone, in an exercise with their team or in a workshop. A summary table using the RACE Planning framework is also included. What does the sample plan contain? The template example business is Health Recruitment, a fictitious company, looking for more clients in the private healthcare sector. The example is for B2B social media marketing, but the template can be used for B2C companies and will work for businesses with more complex strategies and a range of audiences and influencers. Related resources: There is a companion social media audit download. We also have more general templates for creating broader marketing plans – download our Example digital marketing plan and Example marketing plan.